Telekom Slovenia has upgraded it IPTV infrastructure with Netgem TV Middleware Device Management System (DMS) which include Netgem’s smart Set-top Box technology. Telekom Slovenia said from 1 September 2010 they will be using Netgem’s intelligent client to roll out tailored applications to its IPTV customers, and that working with Netgem is part of a bigger plan to expose its 120,000 customers to advance television and to experience a new level in home entertainment. NetgemTV Middleware is a next generation hybrid digital TV infrastructure offering the latest in flexible home entertainment; customised channel services, facilitating over-the-top (OTT) services, Video-on-demand (VOD) and more. 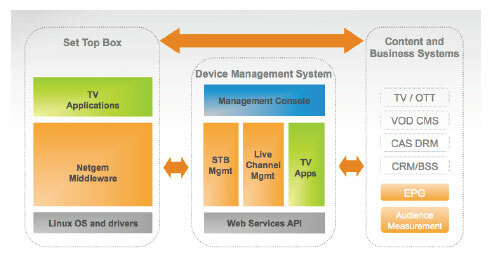 The solution is divided into middleware server, a Web Services API driven architecture which offers both an open, highly optimized and scalable environment for efficiently managing a large number of connected set-top boxes, and middleware client, Future-proof, standard-based solution (DVB, W3C, Open IPTV Forum), which offers customisable user interface with a Linux and HTML 5 embedded. The new solution is being roll out with Planet9, Telekom Slovenia’s multimedia and system integration subsidiary, to launch the SiOL iO, a service which blends broadcast, web and mobile content within a single user interface. SiOL iO is part of a drive to top into the change in consumer behaviour, their desire to share conent in and outside the home, their willingness to merge TV experience with web content, social media, desire to personalise their services, and the growing adoption of connected devices in the home. The new portal will initially offer access to a radio portal, livescore, weather and news, Facebook connect and SiOL.net a news channel which allows subscribers to publish content shot direct from their Mobile phone or webcam. Telekom Slovenia said the move from a legacy system to something more update and to offer these new services was made easy by Netgem’s system ability to integrate with existing systems.